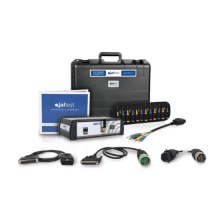 Whether you are working on tractors, straight trucks, trailers or reefers, Jaltest Commercial Vehicle Diagnostic Software has you covered. It is the premier software on the market. Used with Jaltest Info Online you’ve unleashed an incredibly powerful diagnostic tool. Fast connection & code retrieval, place the cursor on the fault code & you’ll get a drop-down box with the troubleshooting procedure along with pictures of the faulty device showing pin testing & test parameters. Need wire diagrams? It’s built into Jaltest Info Online. Diagnostics made easy. Minimize downtime, maximize profits, go Jaltest! Provides ongoing diagnostic reports that can be registered to your customers and accessed by your management via a cloud-based storage system.